Equimins Blooming Pet Liquid Devil’s Claw is of particular benefit to older dogs and cats for the nutritional maintenance of healthy bones and joints. Containing anti-inflammatory properties that will help combat swelling and stiffness of inflamed joints and muscles, Equimins Liquid Devil’s Claw will ease your pet’s movement and maintain the suppleness of their joints. 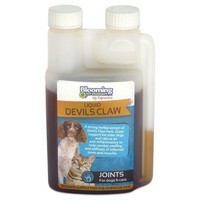 Equimins Blooming Pet Liquid Devil’s Claw is a tincture solution, making the qualities of the herb much more available and therefore quicker to enter the bloodstream.